[German]For Windows 10 there are mysterious updates like KB4078126 and KB4078127, which appear in WSUS. Microsoft hasn’t released details about that updates. Here are a few information about that updates. Yesterday blog reader Ralf E. send me an E-Mail with some information about that mysterious updates arriving in WSUS. I received some Windows 10 updates on 02/02/2017 on my WSUS which I can’t get any information about. These are the updates KB4078126 and KB4078127, which could be microcode updates? The date mentioned above should be a clerical error, and should be February 2, 2018. Ralf send me a a screenshot of theses updates obtained from WSUS. There is a reference to Windows 10 Version Next for ARM64, which refers to upcoming Windows versions. There is also a note about a Dynamic Update or ComponentUpdate. 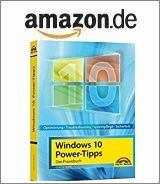 Dynamic updates are intended for installation and resetting (see my blog post Windows 10: What are dynamic updates? for more details). Overall I guess, these updates are planned for upcoming Windows 10 version 1803 or later, and it is dedicated, to update a component. There is another update KB4078128, that’s currently quoted for test purposes. This update has been released in previous version to Windows 10 V1709 (see Windows 10 V1709: Updates KB4058258, KB4074608, KB4077735, KB4078128 and KB4057790). Seaching the web yesterdy brought absolutely not hits in Google. Today I found a mention at reddit.com. It seems not the first time, that mysterious updates arrived for WSUS. My attempt to enter the URL to Microsoft’s support pages for KB4078126 and KB4078127 brought the following message. 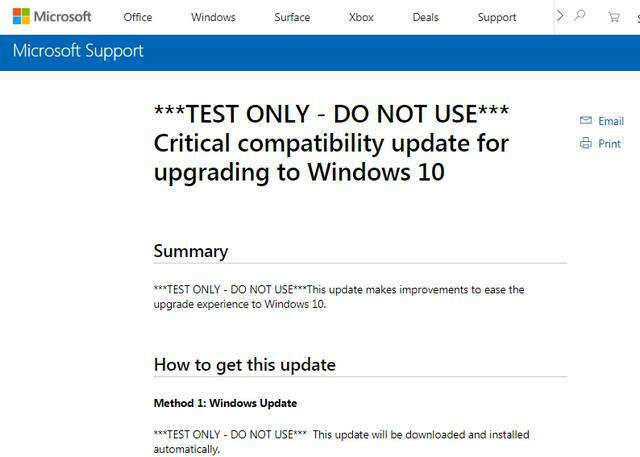 ***TEST ONLY – DO NOT USE*** This update makes improvements to ease the upgrade experience to Windows 10. Here is a screenshot of this Microsoft page with the kb article – it’s the first time, I recognized this. The updates are for testing purposes only and should be hidden, blocked or ignored on WSUS. Any of you guys got any more information? Addendum: I received a private mail from a former MS employee. These updates are for internal MS test purposes only and should never been visible on WSUS. MS is using these updates on internal test machines to check, if a patch works – and after it passed the quality checks, it will be released to the public. Obviously something went wrong, and the updates are slipped out in to the wild. It seems that Microsoft has done this in the past. ZDNet.com has here an article from 2015, where a similar case is addressed. Microsoft have had “incorrectly published a test update”. This entry was posted in Update, Windows and tagged KB4078126, KB4078127, KB4078128, Update, Windows 10, WSUS. Bookmark the permalink.